Everyone has their own interests and priorities when they travel so I’m not interested in hearing why I should have given this tour a better chance. My opinions are my own…and I hated it. We had left Etosha National Park early that morning on our self-drive safari through Botswana and Namibia. 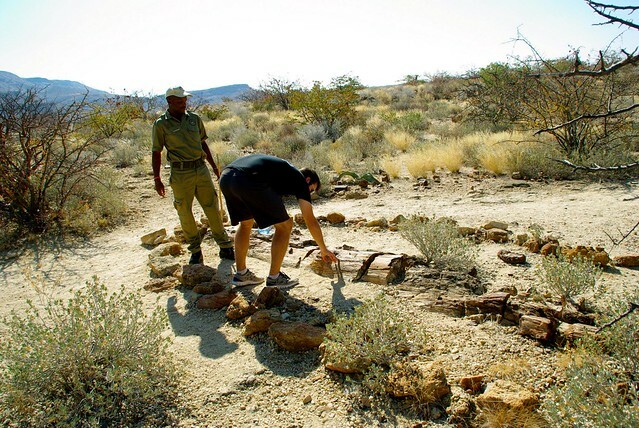 After setting up camp in Khorixas we drove to what seemed like the only thing that people came to the area to see, The Petrified Forest and Twyfelfontein Valley. Could this be a petrified forest? So after arriving in Khorixis and hearing everyone talk about the Petrified Forest I figured that is where I had to go. These photos appeared to be petrified trees. Again at this point I had no idea what a petrified tree looked like or meant, but how many famous trees parks could there be in Namibia? Josh and I drove 88 km out of our way on one of the worst gravel roads we had ever been on, in search of the Petrified Forest. We arrived and were given a mandatory tour guide, which is the last thing we want. Then we found plenty of trees. These trees had been buried under the ground for 200 million years and had become rocks. As you can tell the photo of what I wanted to see and what I actually saw are drastically different. We paid $10 a person to walk around and look at rocks that looked like wood…I felt like this was some huge practical joke and someone was going to jump out and say JUST KIDDING at the end of the tour. So THAT’S what a rock feels like! Lesson Learned: If you don’t do your research before, you have to be prepared to see rocks. In case you are wondering the first photo is from Deadvlei, which we later discovered is located in Sesrium, Namibia. It was one of our favorite memories from Namibia and would recommend everyone going! What was the worst tour you have ever been on… and what made it so bad? Well done! I doubt I could have hidden my disappointment. The place I work has a petrified tree out the front and most people just think it’s a dead tree – they aren’t exactly eye catching. You guys are much better at faking interest than I am. This spring we toured Koh Phangan. All day I’d been talking about this incredible waterfall I’d seen in the pictures. Our guide had confirmed we go to the waterfall. When she stopped at a small “waterfall” about 12 inches high, I thought it was to take a break and wait for the rest of the people. When she said this was the waterfall, I started laughing and doing the whole, “no, really….where is it?” thing before being reassured that this was it. I thought the guide was joking for a solid minute. In hindsight, I realized why they gave out massive joints on the tour boat – everyone that had indulged was perfectly satisfied with the waterfall! I was a bit disappointed to say the least. I had the exact same reaction when I visited what was called a “Petrified Forest” in Washington State (near Vantage). At least at the one you saw, you could touch the trees/rocks. In Washington, they were under rebar lattice to protect them…really?…they are ROCKS!! !…and not even interesting ones. Ha! I love all these awful tours – I think I can honestly say I am not interested in paying to see anything petrified again! The Capitol Building tour in DC. Absolutely ridiculous. Security has become such an issue that all you’re entitled to see is a few lobbies–lobbies! What the members of congress walk through to get to the snack machines, and it takes them a full hour to guide you through it! I seriously considered breaking away and sneaking into some office, but I fear I would have lost my citizenship or something drastic. I booked a last minute trip last year to Egypt. We stayed in a super fancy resort, but since it was my first time in Egypt I wanted to experience as much as possible, so we booked a lot of excursions. They were almost all amazing, but one of them was too ridiculous for words (also because I booked the trip three days in advance and didn’t research where I was going for once, so kind of my fault too). It was a afternoontrip to Hurghada. We would visit the old city with the shops, a perfume manufacturer, the mosque, a catholic church, and the newer parts. I had some sort of Aladin vision in my mind of what the city would look like. HA, what a joke. Turned out Hughada is only 60 years old, and built completely for tourism purposes. There was nothing to see, and we couldn’t even enter the mosque. Now I laugh hard at this, but at the time I wished I would’ve stayed at my resort by the pool and drink free cocktails. Lol, oh, well, we learn! I find this post hilarious. When my friend and I visited Arizona for a week, we spent a day visiting the Petrified Forest National Park. We were expecting something amazing because of all the raves found on google, but we were bored out of our minds! Lol! The hike was so boring we couldn’t wait to be done with it. 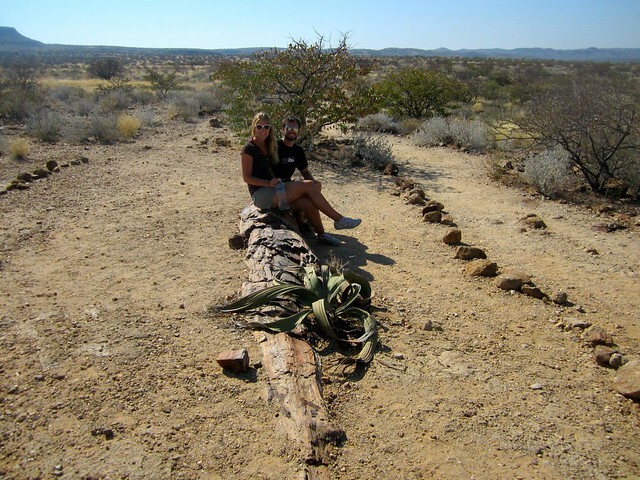 All we saw were petrified logs everywhere. Like you, we couldn’t understand why anyone would want to see it, haha. The most fascinating thing was seeing a man ride on a horse in the distance. Thanks to that experience, I know any kind of petrified forest is not going to be interesting to me.